Here at the International Peace and Security Institute’s summer symposium in The Hague, I have had the extraordinary opportunity to listen to thought-provoking speakers, to be instructed and guided by inspirational faculty, to converse with determined and passionate participants, and to have visited places that are historic and fundamental to international justice. Visiting the International Criminal Tribunal for the former Yugoslavia (ICTY) today was truly an awe-inspiring experience. I could not help but think about the significance of this site relative to international justice. The ICTY was created in 1993 and is run by the United Nations (UN). It was the first Tribunal to prosecute international crimes since the post-World War II Nuremburg and Tokyo trials. The ICTY has sought retributive justice by convicting and sentencing war criminals that would have probably never stepped into prison in the absence of this Tribunal. This facet, along with victim’s participation as witnesses has helped victims and their families move forward. However, there is much debate as to the actual effectiveness that this institution has brought. International justice is a relatively new field that faces a multitude of obstacles. 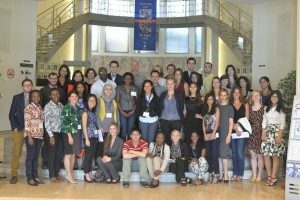 Although the ICTY did not “solve” any of the underlying causes of conflict in the former Yugoslavia, it has demonstrated to the international community that it competent, legitimate, and that it can in fact administer justice. Future tribunals will have an advantage by being able to use the ICTY as a model by which it can see what works and what doesn’t work. This Tribunal has taught us many valuable lessons, including understanding that transparency is both essential and possible. This ties in with the message from our afternoon speaker, Mr. Thomas Verfuss, President of the Association of Journalists at the International Criminal Court, who discussed journalism in post-conflict settings with us. 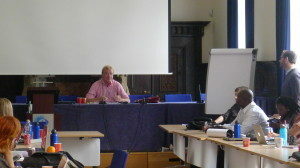 Mr. Verfuss explained the major role of the media in such situations. Firstly, journalists and the media help assist in ensuring transparency, which protects the rights of the accused and therefore reinforces the legitimacy of the court. Secondly, it helps for reconciliation to take place by enabling for the victims to be heard through media outlets such as the Internet, and in the case of the former Yugoslavia, television. Thirdly, it helps to deter these types of crimes from taking place through the medias power to inform the public and its ability to shift the public’s focus on certain issues. Courts use the media to sensitize and educate the general public. If it were not for journalists and the media, the international community would respond to far fewer crises than it currently does. This is also the case with the ICTY. The media played a vital role in directing the international community’s attention towards the former Yugoslavia. Going back to the ICTY and its role in international justice, Mr. Verfuss stated that the conflict in Yugoslavia was important in the sense that it was the “rebirth of international criminal law.” This is essential to grasp when analyzing this particular tribunal because it provides an explanation for the obstacles that this process faced, in addition to reassurance in future successes. I have learned so much these past three weeks, not only from the high quality and knowledgeable speakers, but also from the faculty and fellow participants. We are truly in an amazing place with amazing people. International justice and tribunals such as the ICTY require improvements and advancements to be made, and they need people to do it. I believe that is why the 36 of us are all here.